Karime Castillo is originally from Mexico City. She received her B.A. in Archaeology from Universidad de las Américas Puebla and her M.A. in Artefact Studies from the Institute of Archaeology, University College London. 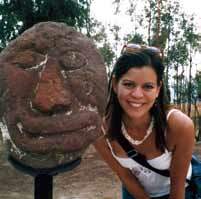 She is primarily interested in Mexican historical archaeology and colonial material culture. Her master’s thesis proposes a typology of pharmaceutical glass from London. As a historical archaeologist, she has done research on Colonial Mexican majolica and the Hacienda San Miguel Acocotla, Puebla, Mexico. She has worked for archaeological projects in different parts of Mexico, including Sonora, Mexico City, and Puebla, and has collaborated with the Franz Mayer Museum in Mexico City and London Archaeological Archive and Resource Center in London. At University of California Los Angeles she will study glass production in Colonial Mexico. Colonial Mexican majolica and the Hacienda San Miguel Acocotla, Puebla, Mexico. She has worked for archaeological projects in different parts of Mexico, including Sonora, Mexico City, and Puebla, and has collaborated with the Franz Mayer Museum in Mexico City and London Archaeological Archive and Resource Center in London.